Get the junk out of the attic! We clean up, remove and recycle any unwanted items in your attic. We remove all types of junk and clean sweep your attic. For your attic clean out service in Marblehead, MA call us today to get your attic cleaned of boxes, debris, old furniture, old insulation or whatever needs to be removed to make your attic usable again. 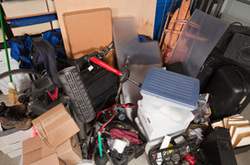 Call GEO Junk Removal at 978-778-6323. We're your local junk removal company in Marblehead, MA . Let us do the heavy lifting and dirty work and make your attic clean again!